A WO ANNUAL tal legislation—certain to have un- precedented ramifications for the tug and barge industry—the asso- ciation was not intimidated or apo- logetic. AWO, in developing strate- gy on legislative and regulatory is- sues, began by establishing objec- tives to allow the industry to retain credibility and participate in the process. AWO's strategy focused on credibility trying to make improve- ments in the legislation which would enable its members to continue in the business of transportation with- out sacrificing environment protec- tion. Clean Air Act requires the Environ- mental Protection Agency to estab- lish national standards for emis- sions from marine tank vessels. The barge industry will not be exempt from regulation if its emissions sig- nificantly contribute to a deteriora- tion of health or the environment; yet the language adopted by Con- gress clearly requires cost-benefit to be a factor in determining the ex- tent of cargoes which will be regu- lated. This provision, in our view, will help to depoliticize the process of identifying legitimate sources for regulation. Act of 1990, overall this new law has many positive aspects. It is the first comprehensive plan, taking into consideration liability, cleanup, safety, hull configurations, penal- ties, and other preventive measures. It inspires prevention, and crew training, legislating guidelines for oversight by management. AWO's legislative objectives were clear as the bill went to conference between the Senate and the House of Repre- sentatives: development of a reason- able schedule phasing out single hull tank barges; improvements in the language so that "good samari- tans" and cleanup contractors would not be precluded from pro- viding assistance; and a distinction in minimum liability limits between small barges and tankers. These ob- jectives were achieved. Although it is far too early to pre- dict the longer term impact of its provisions on the marine transpor- tation of petroleum and petroleum products, serious problems, howev- er, have already arisen from the absence of federal preemption of state oil spill laws, overwhelmingly defeated by Congress. The omission of federal preemp- tion ... in essence the failure of the bill to prevent states from establish- ing laws and regulations similar to, or in addition to, the requirements set forth in the federal act . . . encourages an increasing number of states to impose unlimited liability, an "uninsurable risk." Circle 256 on Reader Service Card and international marine insurance community will certify only federal requirements. Will the effects of increased transportation cost, distorted and interrupted transportation pat- terns, rising insurance costs, re- duced vessel availability and de- layed payments for damages to spill claimants allow for the eventual mi- tigation of the onerous provisions of the act? These questions will begin to be answered within the next few months. AN INTERFACE UNIT. Robertson's new gyrocompass eliminates the cost and inconvenience of mixing equipment because it's designed to work directly with our AP45 Autopilot. 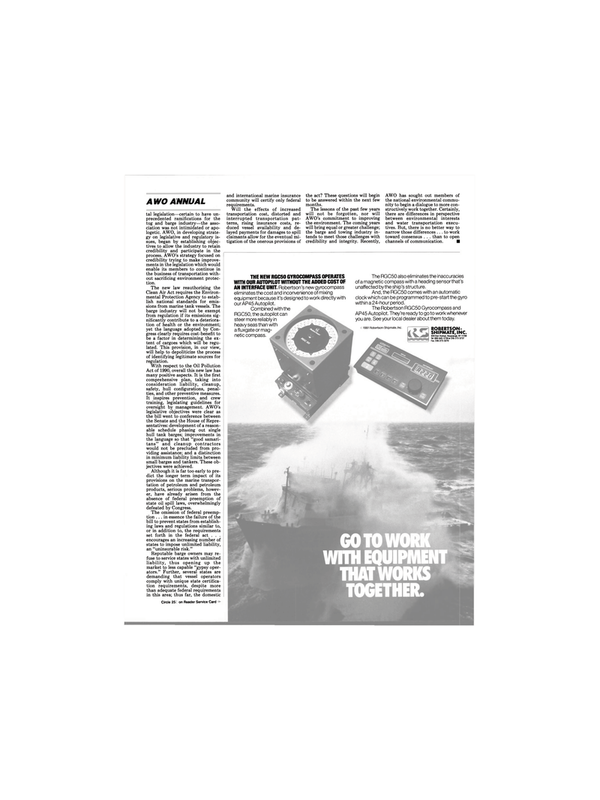 RGC50, the autopilot can steer more reliably in heavy seas than with afluxgate or mag- netic compass. The RGC50 also eliminates the inaccuracies of a magnetic compass with a heading sensor that's unaffected by the ship's structure. And, the RGC50 comes with an automatic clock which can be programmed to pre-start the gyro within a 24-hour period.